As the new executive director of the Headwaters Health Care Foundation, replacing the recently retired Joan Burdette, Ms. Boylen-Pabst is tasked with guiding the organization into a new era. It's one she isn't taking lightly. Officially beginning in her role on Dec. 17, Ms. Boylen-Pabst has had the better part of seven weeks to acclimatize and familiarize herself with her new surroundings. That adjustment period has been helped by the fact that Dora considers herself a resident of the Headwaters region. Residing in Schomberg, the career fundraiser says she's treating this new position as something of a homecoming. “I'm very excited to be here. 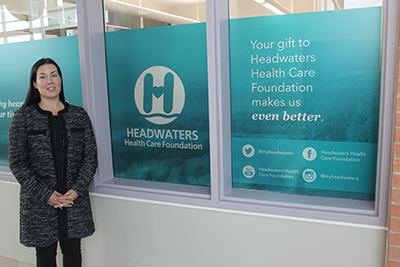 I've always called Headwaters (Health Care Centre) one of the province's best-kept secrets. Now, to be a part of it, it's a fantastic opportunity,” Ms. Boylen-Pabst told the Citizen. As the primary fundraiser for our local hospital, she says the work undertaken at the foundation level cannot be understated. Each and every year, the organization raises and then donates millions of dollars to the facility to ensure HHCC continues to meet the needs of the community and remain at the forefront of the health care sector. With 22 years' experience in fundraising, the last 11 of which spread across stints as vice-president of Newmarket's Southlake Regional Health Care Foundation and vice-president of the North York General Foundation, Ms. Boylen-Pabst has a lot of experience in the industry. Now, she hopes to use that to take HHCF to the next level. While it is the foundation's job to assist the hospital in improving any and all aspects of service, Dora also wants to make the community aware of the “fabulous” programs in place at the local facility. The year 2019 is an important one for both the foundation and the hospital. Each organization will be working on and unveiling a five-year strategic plan. The process for that at the foundation will begin in the fall..
With two months to go in its current fiscal year, the foundation is still raising money to purchase equipment on the hospital's 2018 wish list. To date this fiscal year, the foundation has raised just over $2.3 million.